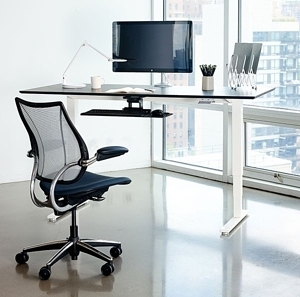 If you’re in the market for an adjustable-height desk and are willing to put in 20 seconds of elbow grease each time you want to switch from sitting to standing, then a manual desk will save you some coin. Unlike the more common electric-adjustable standing desks, manually-operated desks change height without motors, electronics, or power cords. This makes manual desks slightly more affordable than electric models. The only tradeoff is that manual desks are generally slower to adjust and require more effort from the user to lift and lower. As with any category, there is a spectrum of quality among the different available products, with a few standouts that rise above the rest. We’ve done the legwork for consumers by looking through the most popular manually-adjustable desks on the market today, evaluating them, and writing an in-depth review for each. 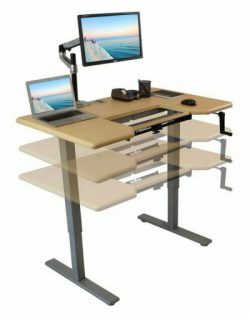 As we explain in our Adjustable Height Desk Review Criteria, we look at a number of attributes and qualities when evaluating products. These include weight capacity, lift speed, stability, noise, ergonomics, customizable options, and assembly. To learn more about our review process in general, visit our Anatomy of a Review primer. Each of our manual desk reviews fall under one of three categories. Crank-adjustable desks are the most popular adjustable mechanisms, and are generally more affordable than their motorized counterparts. 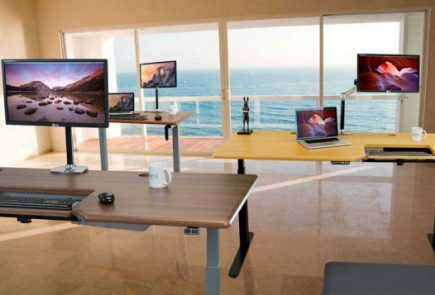 One-time adjustable standing desks, which often misleadingly tout themselves as “manually-adjustable,” are always crawling out of the woodwork but rarely a good solution for a sit-stand or treadmill desk. Alternative bases use methods such as counterbalance, spring-loaded, and gas-strut mechanisms and offer more adventurous desk seekers something different. Below, you’ll find abstracts of each product review by category. Click on the product name to read the full review, or the button “Add to Comparison Table” (then ‘Go’ in the bottom right) to see their features side by side. 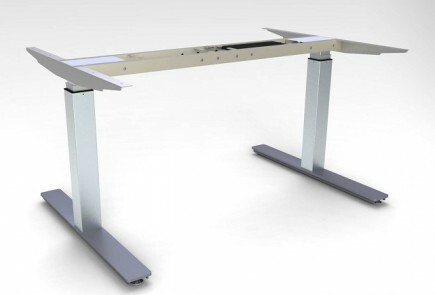 Manual adjustment desks rely on a user-operated crank mechanism, generally located in a corner either under or on top of the desktop, though on some older models, the crank can be found in odd places like on the side of one of the lifting columns or on top of the table. Most crank desks move at a rate of two to six turns per inch, and adjusting from sitting to standing or walking generally takes under a half a minute. 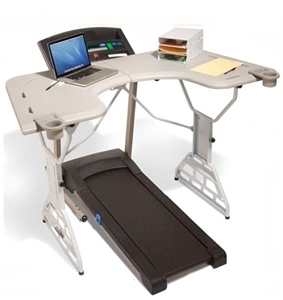 Crank-adjustable desks are especially popular in shared treadmill desk workstations, which don’t need to adjust all the way down to sitting height. There are some older crank desks on the market with a very short height adjustment range (“stroke”) of about 14″. 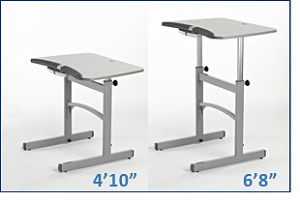 These models can be shared between people of different heights, but not used as a sitting desk. Ironically, they are typically more expensive and have slower cranks than the more updated models we review here. Pros: Designed by Martin Keen, the Focal Locus Standing Desk boasts an aesthetically minimalist design that’s attractive in both the home and office. The table top also has an adjustable angle, easily switching from a desk to a drafting easel. An architectural design element, not just a desk. Pros: Prior to some new competitors entering the market, e.g. 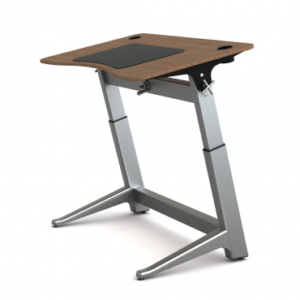 the Ellure, the ModTable was extremely popular among budget-conscious desk seekers. It’s got a speedy height-adjustment rate of two turns per inch (tpi), with a lifting capacity of 180 lbs. Pros: Assembly is a breeze, with many of the components already assembled. 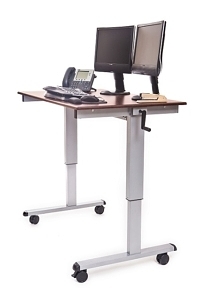 Its impressive lifetime warranty ensures proper desk performance for the desk’s lifetime. Cons: The desk’s laminate arrived peeled in certain parts, ruining the desk’s aesthetic and inviting moisture damage. 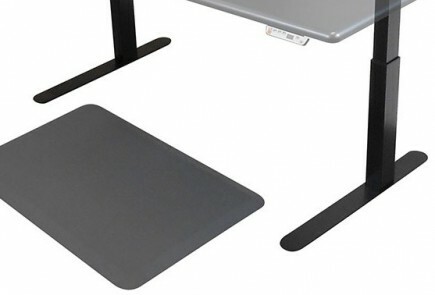 Its height adjustment rate is twice as slow as other crank-adjustable desks. Its maximum height falls well below ANSI/BIFMA standards, and render it unusable for use with a treadmill. Too few customization options. Calling these clunkers ‘manually-adjustable’ is a quite a stretch—users set the height of these desks with locking pins in the telescoping legs. After the initial set-up, these fixed-height desks can’t easily be adjusted to different heights. Users would need to clear the desktop of their equipment and remove or loosen the locking pins to change the height, with the help of a friend, if not two. It’s an exceedingly tedious process not recommended for multiple-user workstations. Pros: Heftier and sturdier than a lot of other desks in this specific category. Gun to our head, we’d pick the DT5 over other one-time adjustable desks. Pros: It’s got cupholders! Wooh! Also, it’s got a large surface area. Pros: The Go has a markedly lower price tag than either the DT5 or TrekDesk. It’s light and portable, which could be good for certain uses. Anyone on the hunt for a fast-moving, high-end workstation could find themselves checking out counterbalance options. A select group of high-end manufacturers have begun to make desks that glide up and down, requiring nothing more than the squeeze of a brake and some minimal help from the user. These desks use a non-electric counterbalance system that offsets the weight of the things on your desk. That’s the theory, anyway—some take a little more muscle than advertised. Be forewarned they are more expensive than electrics, and even the most expensive models will have significantly lower lift ratings than comparable crank desks. Additionally, it is not uncommon for these desks to be somewhat finicky in their tension settings. When they’re well-adjusted, these systems are sleek, impressive, and incredibly quick to adjust: the quickest height adjustment speeds, in fact. They do lack the presets of an electric option, but frankly, who needs them when you can express it to the perfect height in two seconds? Pros: Quick and quiet, the Float Table can adjust from sitting to standing height in as little as a second, with enough practice. It offers plenty of space both on the table top and between the legs, and it offers Humanscale’s signature modern aesthetic. Very popular in high-decor offices such as legal and financial firms.